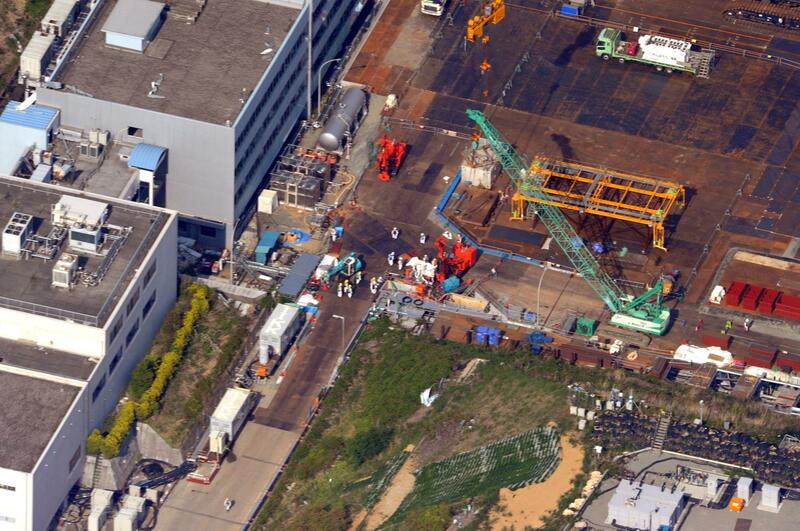 A photo taken from Yomiuri Shimbun's jetliner shows a construction of frozen underground soil walls work starting at the reactor No. 1 (R) of the crippled Fukushima No. 1 nuclear power plant operated by Tokyo Electric Power Co.(TEPCO) in Okuma, Fukushima Prefecture on June 2, 2014. Japanese government and TEPCO created the walls to prevent a contaminated undergroundwater from entering the buildings and facilities at the plant. Sunday will mark the one-year anniversary of the massive earthquake and tsunami that hit coastal Japan.